The MicroMarket, our newest and only self-serve retail unit, is located in the new School of Sustainable Design Engineering Building. We currently offer locally roasted Kettle Black coffee, an assortment of Bigelow teas, lots of confectionary items, bottled beverages, delicious pastries baked in-house, and chef-made On the Go items. Hours are subject to change for holidays, campus events and weekends. Located at the Robertson Library, in what is affectionately known as "The Pit," Samuel's Cafe is the perfect stop for your lunch, coffee, or snack breaks. You can find Van Houtte coffee, Davids Tea, bagels, pastries, daily soups, our 550 Pizza, and our latest addition: chef-made hot lunch specials. We've rebranded Samuel's Cafe over the summer so expect to see some awesome changes and surprise additions throughout the year! Samuel's Cafe is located on the first floor of the Robertson Library across the foyer from the circulation desk. Looking for a change and lots of options? Head over to the AVC Cafe! Their menu includes made-to-order chef-made meals, our On The Go products, and our 550 Pizza made with local Glasgow Glen Gouda Cheese! 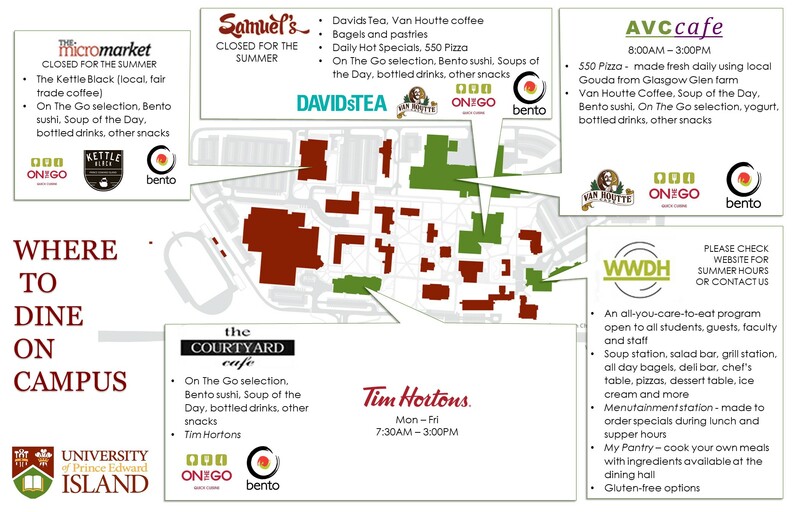 The AVC Cafe also offers two daily soups, a breakfast menu and deli bar for lunch, and all our cafe features such as Van Houtte coffee, pastries, and a fully stocked confectionery. Hours of operation are subject to change for holidays, campus events and weekends. The AVC cafe is located in the Atlantic Veterinary College and is best accessed through the central entrances. The Courtyard Cafe is lcoated in the W.A. Murphy Student Center, the hub of campus life. Here you can find a full service Tim Hortons which offers their full drink and breakfast menu, as well as their full range of all-year and seasonal baked goods. The Grille, confectionary, and our grab and go options will continue to be offered at this location! The Courtyard Cafe is located on the first floor of the W.A. Murphy student centre next to MacMillan hall with plenty of great space for dining with friends. The Wanda Wyatt Dining Hall is a great place to meet, relax and enjoy a wide range of healthy foods that blend traditional, home-style comfort foods with popular retail offerings. Vegetarians have no problem finding something to satisfy their appetite here! The menu also adds some spice from around the world on a regular basis such as flavours from India, Thailand and Greece. It is an all-you-care-eat program open to all students, guests, faculty and staff. The Wanda Wyatt Dining Hall is at the southern end of campus and connected to Bill and Denise Andrew Hall Residence.